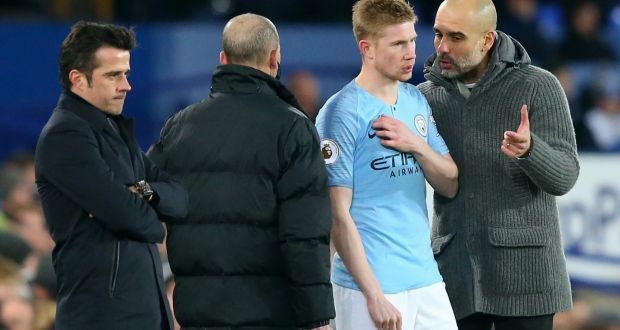 Pep Guardiola said Manchester City’s return to the top of the Premier League was reward for their refusal to concede the title to Liverpool but warned his team face “a final” against Chelsea on Sunday. City returned to the summit for the first time since mid-December with a 2-0 victory at Everton courtesy of goals from Aymeric Laporte and the substitute Gabriel Jesus. They lead Liverpool on goal difference and have played one game more. But having faced the possibility of losing touch when they met on January 3rd, Guardiola insisted the recovery demonstrated the indefatigable spirit of his champions. “It’s much better,” said the City manager of the league table. “It’s the best we can do. The reality is we could have been 10 points behind one month ago when we played Liverpool. A few days ago we could have been seven points behind. Now we are top of the league. “The lesson is never give up. That is a lesson for all athletes. Try to win the games, because life can change immediately. Now we must prepare and recover well for Chelsea. “There are a lot of contenders to fight for the title and there are a lot of games to go. We will drop points and hopefully our opponents will also. With the amount of games we have in our legs we cannot give days off, so to be this consistent means a lot.